The Relationship Between Longitude, Latitude and the Nautical Mile. The Relationship Between Longitude and the Nautical Mile. The Earth’s equatorial circumference is 21640.6 n.m. Since the Equator is a great circle, 1o will subtend an arc of: 21640.6 ÷ 360 = 60.113 ≈ 60 n.m. There are 360 meridians of Longitude so it follows that, measuring from the Earth’s centre, the angular distance between adjacent meridians at the Equator is 1o. Since, as calculated above, 1o subtends an arc of 60 n.m. it follows that the distance between adjacent meridians of longitude at the Equator is 60 n.m. The angular difference between longitude 10o West and the Greenwich Meridian is 10o; therefore, the distance between them at the Equator is 10 x 60 = 600 n.m. The Relationship between Latitude and the Nautical Mile. The Earth’s meridional circumference is calculated to be 40007.86 Km. which equates to 21604.2 nautical miles (n.m.). In other words, an angle of 360o at the Earth’s centre subtends an arc of 21604.2 n.m. on the surface of a meridian of Longitude which is by definition a great circle. As calculated above, an angle of 1o at the Earth’s centre will subtend an arc of 60 n.m. along a meridian of longitude. Therefore, any point on the parallel of latitude 1o North will have an angular distance of 60 n.m. north of the Equator. The angular distance between latitude 62o.8 N. and latitude 48o.5 N. is 14o.3. Therefore, the distance between these lines of latitude measuring due north or south along a meridian of longitude will be: 14.3 x 60 = 858 n.m. Measuring the Distance Between Meridians of Longitude Along a Parallel of Latitude. We know that the distance between adjacent meridians of longitude at the Equator is 60 n.m. This is because the Equator is a great circle; parallels of latitude however, are small circles and this presents us with a problem. In the diagram, PBC and PAD lie on separate meridians of longitude. The arc BA is the distance between these meridians measured along a certain line of latitude. 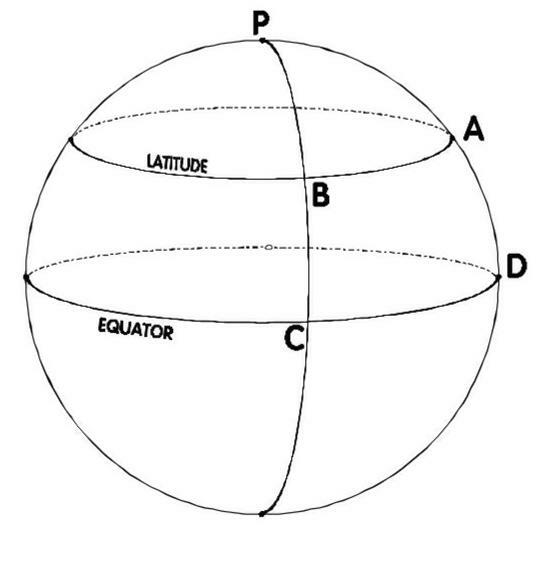 The arc CD is the distance between the same meridians measured along the Equator. Clearly, the distance CD is much greater than the distance BA. The following formulas are used for calculating the difference in distance along a parallel of latitude (Ddist) corresponding to a difference in longitude (Dlong) and vice versa. (The formulas are simply stated below without explanation but a full explanation of their derivation is given in the book ‘Astro Navigation Demystified’). Ddist = Dlong x Cos Lat. and Dlong = Ddist ÷ Cos Lat. Since the secant is the inverse of the cosine, the formula for Dlong can be simplified to: Dlong = Ddist x Sec Lat. This entry was posted in Astro Navigation Topics, navigation and tagged amazon, astro navigation, book, celestial, celestial navigation, celestial navigation made easy, celestial navigation training, eBook, mathematics of celestial navigation, navigation, rhumb line, schools. Bookmark the permalink.